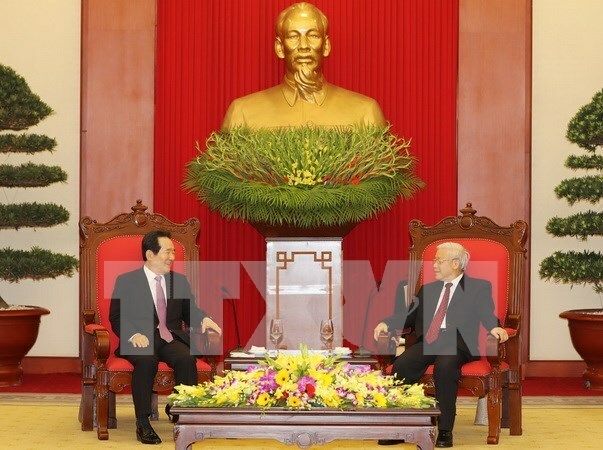 Hanoi (VNA) – Party General Secretary Nguyen Phu Trong wants Vietnam and the Republic of Korea (RoK) to ratchet up the efficient cooperation between political parties, governments, parliaments, and localities to achieve more productive strategic cooperative partnership. He expressed his desire at a reception for visiting Speaker of the National Assembly of the RoK Chung Sye-kyun in Hanoi on April 25. The Party chief warmly welcomed Speaker Chung’s visit at a time when the two countries are enjoying thriving relations and preparing for the celebration of the 25th anniversary of diplomatic ties, and hoped it will help step up the affiliation between the two law-making bodies. He gave high estimations to the outcomes of the guest’s talks and meetings during the visit and across-the-board cooperation, in particular economics, trade and investment. He noted that similar interests, cultural closeness, people’s bonds, and firmly-built social foundation allow the two countries to have huge cooperation potential. Speaker Chung regarded the robust, healthy and efficient development of bilateral ties over the past 25 years as rare in international relations, saying it stemmed from leaders’ visions and concerted efforts made the two people. He spoke highly of Vietnam’s efforts to create favourable conditions for RoK investors and pledged that his country will speed up the transfer of technology to partly support Vietnam’s industrialization and modernization. He expressed his wish and belief that the countries’ relations will continue thriving qualitatively and quantitatively in the coming time. Earlier on the day, Speaker Chung held talks with National Assembly Chairwoman Nguyen Thi Kim Ngan and met with President Tran Dai Quang.